Residents of Bweyogerere, near Kampala are still in shock after getting news of how one of their residents Yvonne Oyo Vena, 28, murdered her co-wife’s 9-year-old son, Zion Ssendagire. Ssendagire was a son to Constance Kisaka. 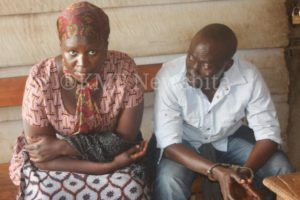 According to Kisaka, it all started when her son was kidnapped from Brosom Nursery and Day Care Centre in Jinja where he attended school. She was informed by school authorities that her son had been taken by his father, Henry Kasirye. “I tried to search everywhere for my son but failed because even my husband’s contacts that I previously had were all switched off until he rang me to call me for the burial of my son. When I asked him what he had died of, [he] simply told me it was severe malaria. I was only able to know the truth when the police came and explained the circumstances surrounding his death,” Kisaka narrated. The fruitless search compelled her to open up a case at Njeru Police Station and investigations were launched. Meanwhile, as Kisaka was busy searching for her son, police learnt about a plot by Vena who was about to bury Ssendagire. Information had trickled in that Vena had hit Ssendagire with a stool on the head, killing him instantly. Further examination of the body also revealed that the boy had been beaten several times and his body was severely bruised. According to police, Vena called upon her close friend to assist her transport the body to Ggwatiro Hospital in Bweyogerere. But after recognising the manner in which the victim was killed, the doctor there declined to render any professional help. It is at this point that Vena decided to take the body to the husband’s village in Zirobwe-Kaleerwe for burial. According to information from Kampala Metropolitan Police, ASP Karim Magid from Bweyogerere learnt about the whole process and he led a team of men in uniform to halt the process. Police also say that as burial arrangements were being made, announcements barring anyone from viewing the whole body other than face, made rounds. On examining the body, Bweyogerere Police discovered serious injuries on the head, nose, stomach, chest and strokes of canes on the entire body, forcing them to halt the burial arrangements. The body was taken to Mulago for a post mortem which confirmed that the child was tortured to death. Police went ahead to search search Kasirye’s home where they recovered the deceased’s clothes with bloodstains and a stool commonly known as ” Malaya Asiika” which had been used to hit the late Ssendagire. Consequently, Kasirye and Vena were arrested and are still being held at Kireka police.